Summary: While having a collection of 4K Ultra HD Blu-ray discs, ISO, or folders you may always feel the need for a UHD copy software. Here we will introduce you the best UHD copy software – DVDFab UHD Copy. DVDFab UHD Copy is a UHD copy software which is specially designed for 4K UHD discs, ISOs, and folders. With the help of it you can copy an entire or just the main movie on a 4K UHD BD disc to an ISO or a folder in 1:1 lossless ratio. To save money on Blu-ray discs DVDFab UHD copy software provides compression and conversion. During the compression and conversion process, the BD-XL’s 2160p quality is retained and gets copied to the new blank BD-50/25 disc, ISO, or a Blu-ray folder. You can also use the clone mode to clone your entire 4K UHD Blu-ray disc to an ISO file. If you don’t have a BD-100 disc but an ISO or a folder then it will be treated the same way as if it is a physical disc. You can just compress that BD-XL ISO or folder to a BD-50/25 disc, ISO, or a folder. As you know that a BD-100 physical blank disc may cost above $10 dollars, which is not at all reasonable if you want many of them. The good option is to copy your BD-100 discs on BD-50/25 discs which are much cheaper. The copying process is done by DVDFab UHD Copy software which retains the latter disc’s 2160p quality on the newer BD-50/25 disc. This way you can save a lot of money with minimum picture quality loss. And the copied discs will be supported by a wide range of Blu-ray players and BD-ROM drives. So, in the above section, I just have explained the main function of the DVDFab UHD Copy software in detail. Now in this section, we will look upon its other functions in detail. I’ll explain each and every function of DVDFab UHD Copy software in detail. Below are the 3 main functions of DVDFab UHD Copy that you can read in detail. The Full Disc Copy mode will make an entire replica of your physical BD-100 disc including menus, trailers, songs etc. to another BD-50/25 disc while retaining the 2160p resolution. 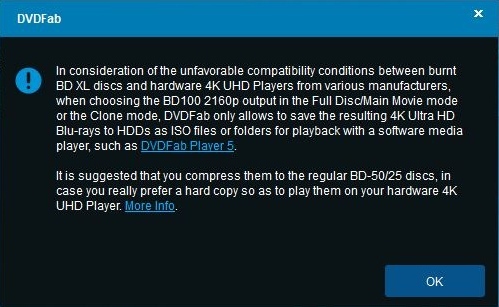 If you currently don’t have the blank BD-50/25 disc then you can copy and save the disc media as an ISO or a folder and later you can use the DVDFab Blu-ray burning program to write or burn the ISO or folder to a blank BD-50/25 disc. Please note that if you want your BD-100 4K UHD disc to be copied to a blank BD-100 disc then this is not allowed. Because due to compatibility issues between BD players you can only save the full disc as BD-100 ISO or a folder. But BD-50/25 discs can be directly written by DVDFab UHD copy software. Here’s the list of possible outputs that the Full Disc Copy mode offers. Copy the entire UHD Blu-ray source to an ISO file or folder with BD-100 2160p quality. This would be 1:1 lossless conversion. Copy and compress the entire UHD Blu-ray source to a BD-100 disc/folder/ISO file, with 2160p quality. It is not a lossless conversion because this output requires compression of BD-100 media to fit under 70GB data on the BD-100 disc. But during the conversion, the original 2160p quality is retained so most of the time you won’t see any picture quality differences. Copy and compress the entire UHD Blu-ray source to a BD-50 disc/folder/ISO file, with 2160p quality. It is also not a lossless conversion because this output requires compression of BD-100 media to fit on a BD-50 disc. Copy and compress the entire UHD Blu-ray source to a BD-25 disc/folder/ISO file, with 2160p quality. Again this is not a lossless conversion because this output requires compression of BD-100 media to fit on a BD-25 disc. I am not sure but the media has been compressed by four times the original media so you may find minor picture quality differences. I said minor differences so they won’t degrade your 2160p viewing experience. A BD-25 is the cheapest way to copy a UHD Blu-ray source with 2160p quality, thanks to DVDFab UHD Copy software. If you want to copy only the main movie and want to skip the menus and any other unwanted media from the UHD Blu-ray source then opt for the Main Movie Copy mode. The Main Movie Copy mode also gives four output modes which are as follows. Copy the main movie of a UHD Blu-ray source to an ISO file or folder with BD-100 2160p quality (lossless 1:1 copy). Copy and compress the main movie of a UHD Blu-ray source to a BD-100 folder or an ISO file, with 2160p quality. Due to compatibility issues between the BDXL and hardware Blu-ray players from different manufacturers DVDFab UHD Copy only allows a BD-66 output to be copied as a BD-100 ISO or a folder or compress the source to fit in a BD-50/25 disc. It can output or burn to a physical BD-100 disc. The same thing applies to the Full Disc Mode. Copy and compress the main movie of a UHD Blu-ray source to a BD-50 disc/folder/ISO file, with 2160p quality. Copy and compress the main movie of a UHD Blu-ray source to a BD-25 disc/folder/ISO file, with 2160p quality. The Clone/Burn function only copies the entire UHD Blu-ray source to an ISO file with BD-100 2160p quality (lossless 1:1 copy). Simply saying, it makes a UHD digital copy of the original source disc. It is a lossless conversion so there won’t be any picture quality differences. So , these were the main functions of the DVDFab UHD Copy software that you just read in detail. · Supports three modes which are full disc, main movie, and clone/burn. · Supports 1:1 lossless copy for BD-100 discs. · Allows you to create ISOs or folders out of multiple BD discs. · Has an inbuilt 4K burning software so you don’t want any third party Blu-ray burning software. 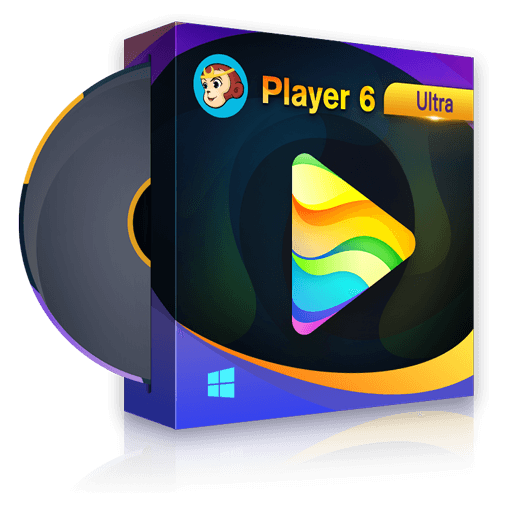 · Easy to use and works with physical BD discs, ISOs, and folders. · Conversion and copying are backed by Intel Quick Sync and Nvidia Cuda for faster processing. · Copied discs have a high compatibility with hardware Blu-ray players. So, that was a detailed review of DVDFab UHD Copy software - a 4K UHD copy program. It is the only UHD copy software for this 4K UHD copy purpose having support for BD-100 discs. You’ll be amazed by its compression technique which retains the 2160p quality while copying the BD-100 media to a BD-50 disc. This UHD copy software can save your money and can give you the same 2160p viewing experience out of the BD-50/25 discs.